and worked on it in the car. A lot less than expected. You know how I said it was a 6 hour drive to Montreal? Well, I thought I'd have 6 hours to knit. Each way. That's a lot! Until you take into account the time that I'd be driving. Or sleeping. 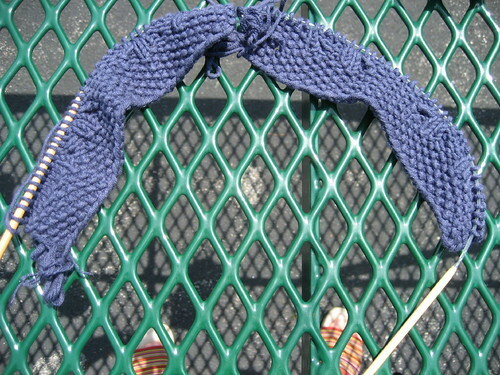 Or too hot to knit. Yep. 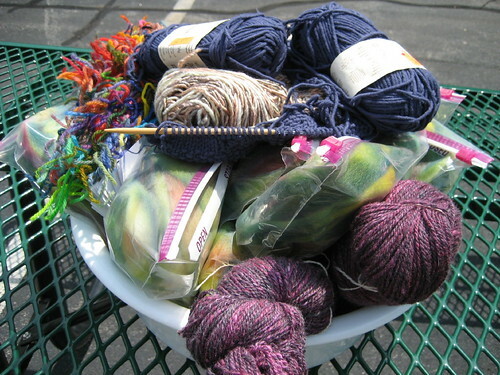 I'd say I knit a good hour in the car. Maybe two. And not at all the rest of the trip. and magically completed Monday night! 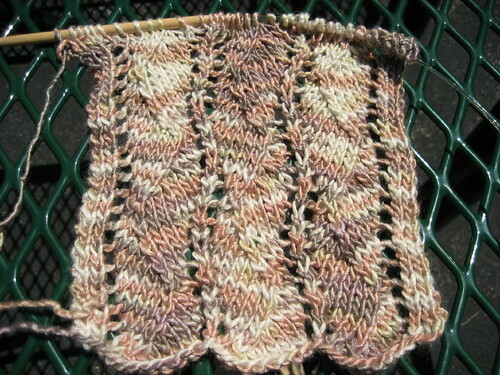 I thought I still had a good foot to knit, but then I tried it on and it was good to go. And I was at the end of a repeat, too, so all I had to do was tink back a row and cast off. Nice. Just need to block her out. 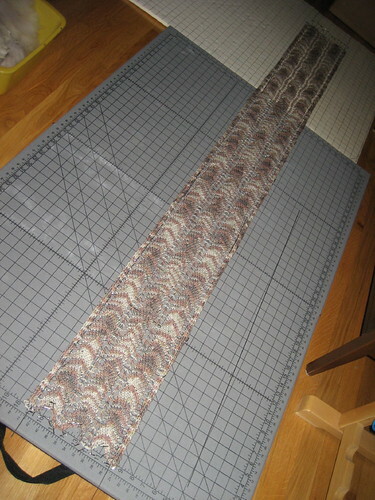 With all that knitting I thought I'd have time for, at the last minute I wound that rambouillet/silk on my yarnwinder and threw it into my bag with the 3 skeins of sock yarn (that I didn't use). 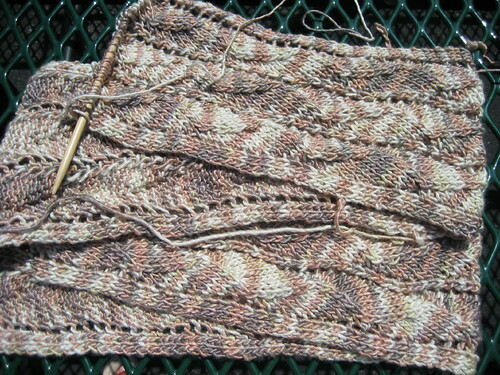 I had a pattern picked out and 4 different needles to test out the gauge. Of course... I forgot the pattern. 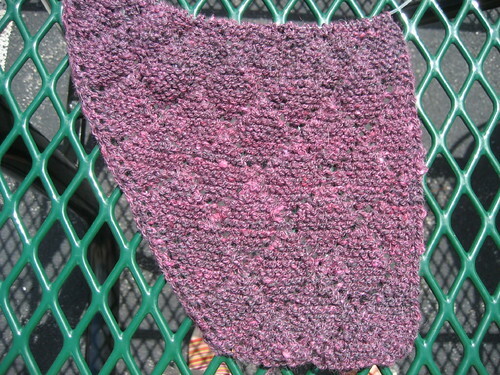 The pattern is "A Beginner's Triangle" from A Gathering of Lace. I'm still thinking up a name for the project. Any suggestions? 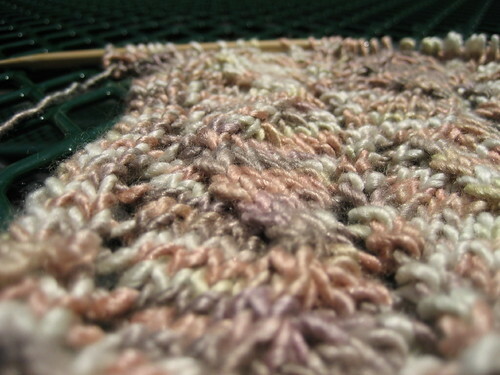 I'm really enjoying knitting with this yarn. 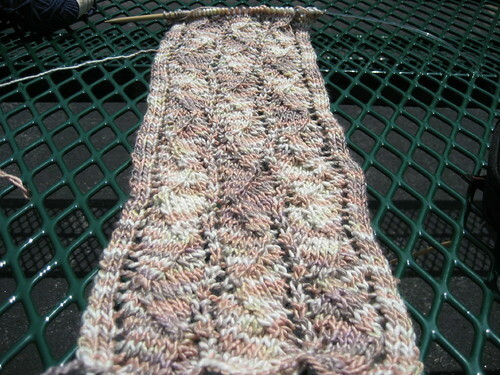 It feels really good and I think it's working nicely with the pattern. 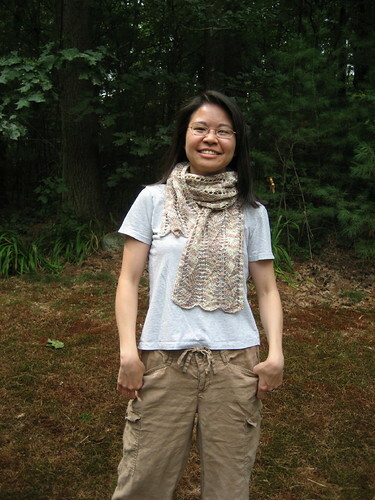 Which is hard to tell without a contrasting background or slight blocking. But trust me. Er, trust Scott. He's been reassuring me. Thanks so much for the support. I have taken a lot of your ideas, suggestions and advice to heart, and honestly, it's helped. I'm feeling much better about Gram being in the nursing home. I think it's the best place for her right now. The nurses seem nice, and she's in the dementia ward, so they'll know how to understand and help her. We saw her Sunday and she didn't make a lot of sense to us. I'm hoping the transition disoriented her and that she'll bounce back a bit. But even if she doesn't, well, it is what it is. It's part of the process, and unavoidable. She's safe, and cared for, and that's what counts. Scott and I are planning a trip to Montreal this weekend to take a break, get away and have some time to ourselves. Oh, and have fun! I've been to Montreal a few times. 8th grade class trip... random weekend drives in college... oh yeah, the time I went with some girlfriends for Jazz Fest, on Canada Day, when the border guy asked why we were going to Canada. Me: "To have fun!" Hands in the air! Youthful exuberance! Luckily, I looked young AND innocent, so they didn't search the car for drugs. Heh. It'll be fun. goodies galore! sunny day! green picnic table! 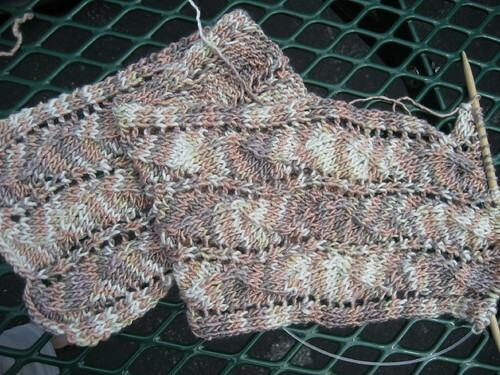 I finished plying the rest of the rambouillet/silk, and now have 2 empty bobbins! 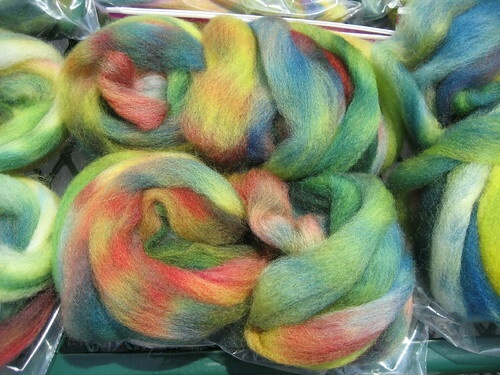 (I was counting my bobbins the other day and was short one. I counted, recounted, searched around, recounted, searched some more. Gave up. The next day, it hit me. It was on the wheel. Doh!) 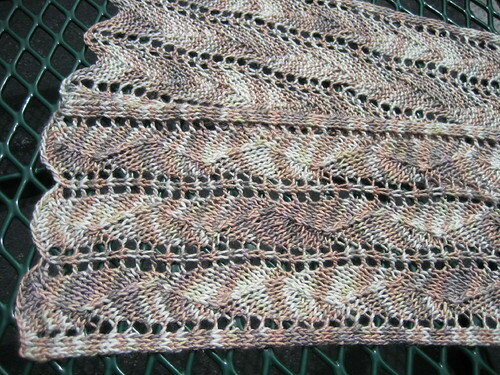 The top skein is the one I showed you before, the bottom is one of the new ones. In all, about 1050 yards over 8.8 oz. 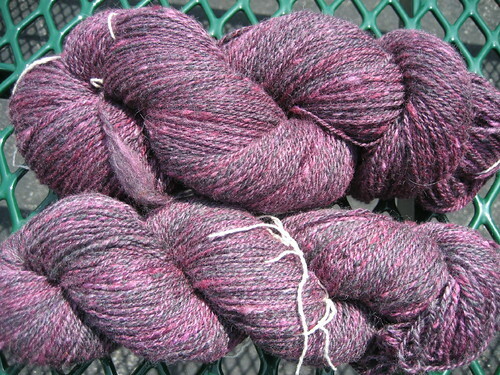 I think it's the most yards I've spun for one project. I lurv it. 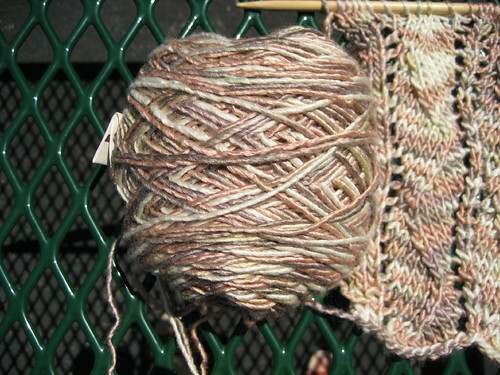 The first skein bled in the wash so I wanted to see if there were color differences. It's (slightly) noticeable in another photo, but not this one. 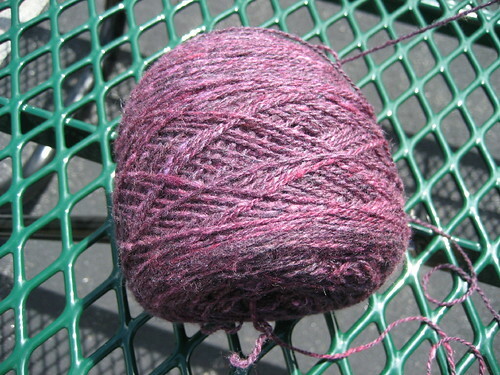 I could spin each bit separately and have slightly different and somewhat coordinated skeins, or I could alternate between the bits to get 12 more-or-less-matching ounces. Not sure which way to go. 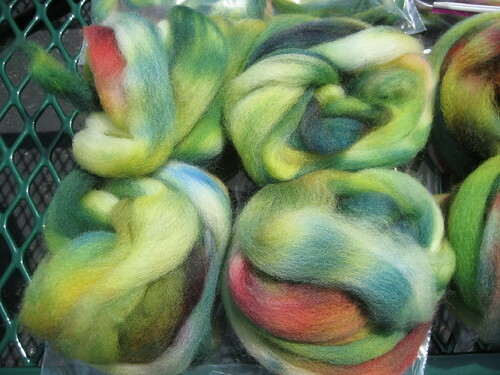 I'm trying to spin up 2 matching skeins for someone and the bit already spun may be more green than the green bit above. Ah well, it's been too hot to spin most days anyway. hey, you can see my feet! Last, look at the color! 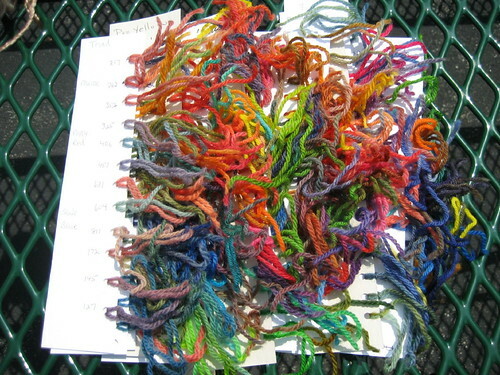 These are the sample cards I walked away with from my dye workshop with Linda Whiting. 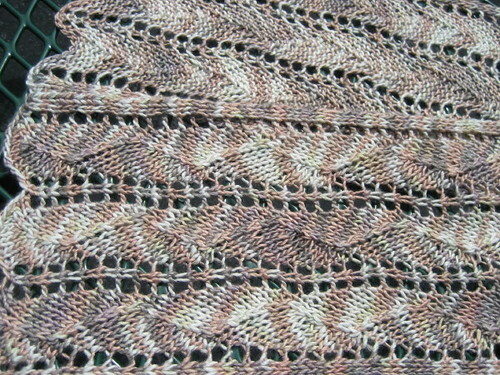 Purty darned cool. I had a really good time, met some new folks, learned a few things. I'll try to put together a few thoughts later this week. Tomorrow: the CVM fleece. It's sorted, and a bit of it washed. 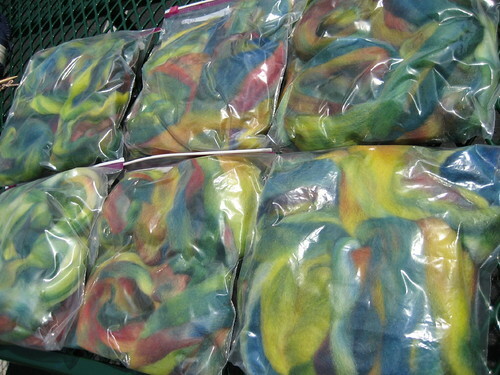 I never figured myself for a fleece processing person, but I seem to be becoming one. I've even reserved a CVM fleece for next year! 8 months from now! I know! 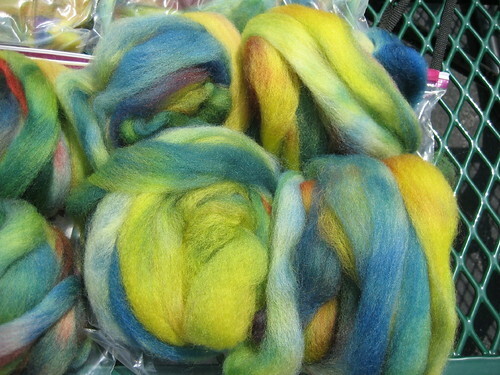 New update on the drum carder: 4 more weeks. Sigh. Thanks for your kind comments about the accident. I read them before we went to Gram's, and as we drove, I felt kinda guilty. Hey, I'm okay, I thought. Talking and writing it out musta helped. Guess I'm over it. Gram wasn't doing so hot. Neither were we. We bought a photo printer last week and printed out some photos to bring with us. Of our wedding. Of our honeymoon. Of the last couple of visits (though the photos we take when we're there all look the same: posed, on the sofa). I had hoped having the photos there would remind her of our visits. I had hoped they'd make her smile. They weren't the 'hit' I hoped they'd be. I don't know what I expected, they're just photos. And when we're there, why would she look at those? We took a couple more again, same pose, same location. I'll print them out and bring them next week. Meanwhile, I'm thinking up ideas for different photos. Something a little more interesting. Wouldn't it be fun to get a photo of Gram sticking her tongue out? Or maybe just one of her laughing. I don't know, she's old school; she comes from the generation when you kept a serious face for photos. She didn't want us to leave. I left feeling that it wasn't enough. Our visit wasn't enough. What we could do was not enough. It compounded with the helpless and useless feelings from witnessing the death. Yeah, guess I'm not quite over it. It's gonna be a rough week. 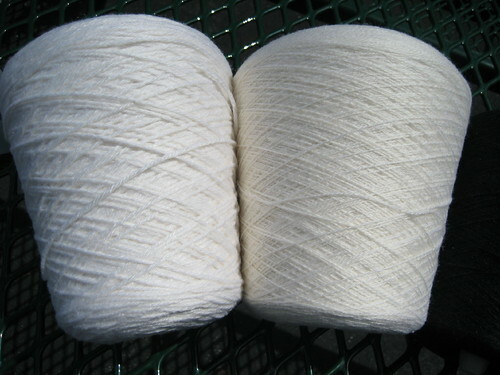 Yarn is Lorna's Laces Lion and Lamb. Yum. 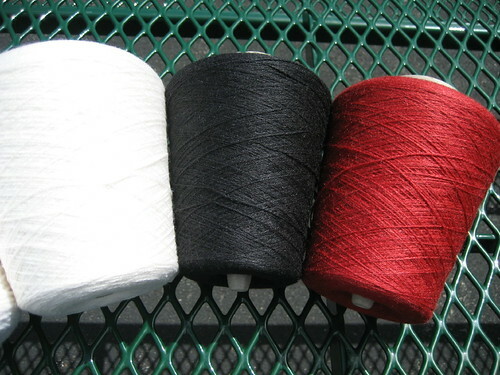 Silk merino, my favorite. 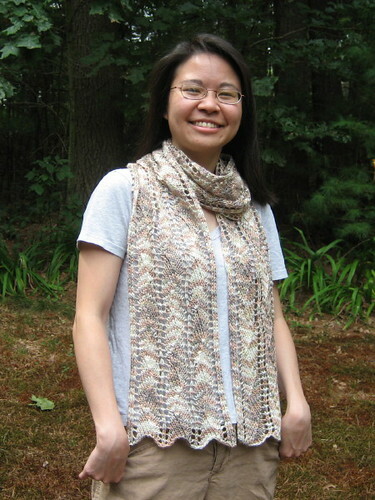 I love the 3-dimensionality of the stitch pattern. Reminds me of sand dunes in the Sahara. 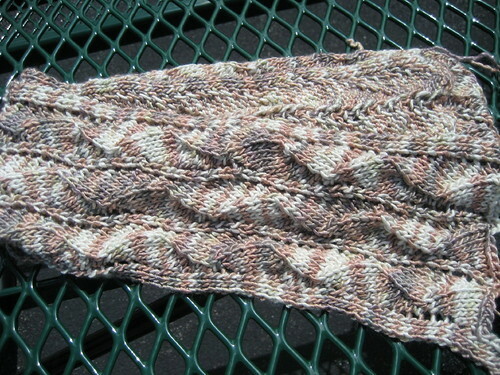 Or, in another colorway, a river. So I think I'll call this project "sand river".